For Relieving Lower Body Pain, Working on these points can help you get better quicker. You do not have to use all of these points. Using just one or two of them whenever you have a free hand can be effective. Location: Below the base of the skull, in the hollows on either side, two to three inches apart depending on the size of the head. Benefits: Relieves pain in all areas of the body, throbbing headaches, dizziness, stiff neck, coordination problems, and irritability. Location: Four finger widths below the kneecap, one finger width outside of the shinbone. If you are on the correct spot, a muscle should flex as you move your foot up and down. Benefits: Strengthens the whole body, tones the muscles, aids digestion, and relieves stomach disorders, knee pain, and shin splints. 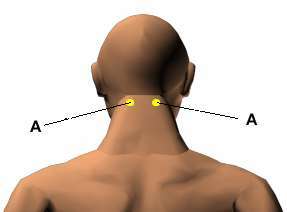 This point is good for pain in a wisdom tooth. Caution: Do not stimulate this point after the third month of pregnancy. Location: Midway between the inside anklebone and the Achilles tendon in the back of the ankle. Benefits: Relieves swollen feet, ankle pain, menstrual cramps, earaches, ringing in the ears, and back pain. Location: Midway between the back edge of the outer anklebone and the Achilles tendon. Benefits: Relieves sciatica, thigh pain, headache, lower-back aches, and rheumatism.